Every individual thinks and functions differently. Even if more than one person is suffering from the same addiction, the same treatment isn’t the answer. To find what works for them, individuals should consider all options available. One type of therapy that’s rising in popularity is individual therapy. Do you think individual therapy is what you need for recovery? Read on to learn more. Regarding addressing addiction, individual therapy involves counseling that takes place on a personal level. Rather than being amongst a large group of peers, a person seeking treatment will be alone with their counselor during treatment sessions. Therapy sessions may continue regularly for months to help the individual break free from substance abuse and addiction. There are advantages to both individual and group therapy. However, undergoing counseling on an individual basis may provide the unique benefits in the list below. Discussing personal issues with another individual can be extremely difficult. But, speaking with a professional that understands what you’ve gone through is liberating. This process can help the individual form a strong bond with their counselor while facilitating more meaningful and proactive conversation. Healing from addiction often involves a deep understanding of what led to the problem in the first place. Looking inside oneself with a view toward gaining this understand can be helpful. This process is more beneficial with the help of a personal counselor. Trust and security are essential elements of getting someone to open up about personal issues. One on one treatment sessions can form close bonds that allow a trust to build. This makes it much more likely that the individual will feel comfortable talking about their problems. Helping someone overcome addiction requires getting to know them on a personal level. This is much easier to do in an intimate setting. It allows the counselor to gain a better understanding of the exact problem areas. Addiction recovery services are readily available. To be able to receive this help, you need to be aware of the problem. Knowing the following signs of addiction can help you get the treatment you need. If a loved one is suffering from addiction, he may develop changes in his looks or personality. Personality changes could include anger, aggression, mood swings, and similar problems. Changes in appearance could involve skin troubles, weight loss, and poor personal cleanliness. When someone uses an addictive substance for a while, he may become accustomed to its effects. This will mean they’ll need to consume more of it in the future. When someone tries to stop using these substances, he may experience painful or bothersome withdrawal symptoms. Those struggling with addiction may try to hide the problem from others. They may not want you to meet their new friends. Alternatively, they may dispose of drug or alcohol-related materials in secret areas. It can sometimes be hard to know the best way to help a loved one dealing with addiction. In many cases, all you can do is let them know you care for them. Remember that 12 step rehab programs and similar options exist for those who seek professional treatment. 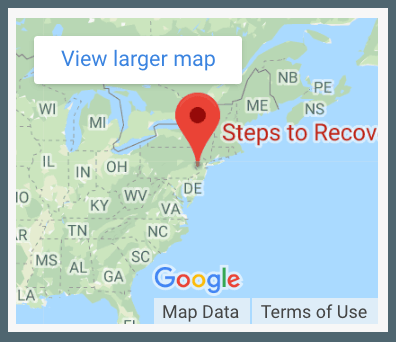 Steps to Recovery is a drug abuse treatment center in Levittown, PA. This facility uses a holistic approach to handle the complex problems that substance abuse can present. Don’t let addiction control your future. You can recover from addiction by getting professional help now. Contact Steps to Recovery at 866-488-8684 to find out how we make a recovery easier.